Offering free wi-fi in stores means that customers can use their mobile or tablet devices without any frustrating connection issues. It is most commonly seen in coffee shops and restaurants, but there are strong arguments for offering this in retail stores, and many retailers are going down this route. In this extract from our How the Internet Can Save the High Street report, I look at the arguments for retailers to provide mobile internet access for customers. This is a relatively new innovation, and may seem counterintuitive at first, but retailers such as Debenhams and Tesco are beginning to roll this service out in their stores. Some retailers may be concerned about the threat of mobile comparison – and Amazon’s excellent mobile apps do present a challenge - but this is a trend that needs to be embraced as there are more pros than cons. Customers are going to use mobiles in store anyway, and this is an upward trend. In the UK 43% of respondents said they had used their mobile to compare prices and look at product reviews while out shopping, up from 19% in 2011. .
As with purchasing on mobile, the likelihood to have researched price information and reviews increases among younger respondents. Q. Have you used your mobile to compare prices and look at product reviews while out shopping? In conjunction with in-store prompts like QR codes and barcodes, and with the retailer’s mobile app, wi-fi can be used to improve the in-store experience for mobile users. Retailers attempting to resist this trend are akin to King Canute. Whatever they do, customers will increasingly use their mobiles to check prices, look for reviews, and find more detailed product information. Retailers can harness this trend and turn it to their advantage by using mobile to enhance the level of information available to customers. For example, they could prompt customers to visit web pages with reviews of the products they are considering in store. This could be a powerful driver of sales. 3G mobile internet connections can vary in quality, and users have to eat into their data allowances to use them in store. 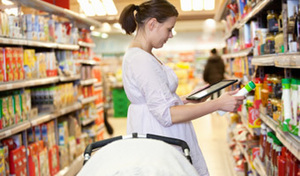 Customers will appreciate free and good quality wi-fi that allows them to carry out their product research in store. Wi-fi in store also provides a way to capture customer details and target them with offers. In fact, many customers would be willing to receive some offers in return for the convenience of accessing a decent wi-fi network. Tesco recently introduced this in its larger stores. It does require a slightly clunky registration process that involves entering Clubcard numbers, but the retailer is then armed with your purchase history. If Tesco can sweeten this process with a discount or two, it may well be worth the effort. According to an OnDeviceResearch survey, 74% of respondents would be happy for a retailer to send a text or email with promotions while they’re using in-store wi-fi. House of Fraser recently ran a promotion in conjunction with O2, using free wi-fi, that aimed to drive incremental sales in the run up to Christmas. Meanwhile, John Lewis recently added wi-fi to its stores. It’s an emerging trend among the major high street brands (not to mention the coffee shops). Mobile can be used to enhance the in-store experience for consumers, as well as providing retailers with some precision tools to target the mobile customer. A blend of location and personalisation can make life easier for customers, while allowing retailers to target customers with relevant offers and recommendations. As we saw with the Casino example in this post, an iPhone app allows users to compile shopping lists before heading to the store, where they can use their mobile to scan and pay for items in store. This is useful for the customer, but also provides the retailer with a wealth of information about the customer’s preferences and shopping habits. Combine this with technology like Tesco’s in-store ‘sat nav’ app and you have the ability to target customers in real time, according to their location. Let’s say the customer is entering the dairy aisle. They bought a particular brand of butter last week, and there’s an offer on that this week. Tesco could notify them and point out that the product is a mere five yards away from where they’re standing. This will be the future of retail, for those customers who opt in. Customers already have the smartphone and tablet technology in their bags and pockets that makes this kind of thing possible, it’s just a question of adapting to it and making it easier for them to use their mobiles in-store by providing wi-fi. Providing in store wi-fi and using it for in-store promotions is relatively new, but Debenhams has just rolled it out in all of its UK stores, which suggests that there is something in it. This is something we’re keen to see more data on, so if you’d like to share your results with us, please leave a comment. Some free wi-fi services have long registration processes, which can ask for far too much information, and take too long. Remember that people are using a small screen and will have limited patience with a poor experience. It’s fair enough to ask for some data from customers, but don’t go overboard. Wi-fi can be a draw for customers, and if you’re looking to get customers to use their mobiles, then make sure they know they can get online. For example, we reviewed Sainsbury’s in-store scan and go app yesterday, and commented that the retailer should provide wi-fi to improve the user experience. In fact, it was pointed out to us that wi-fi was available, but you have to ask a member of staff for the password. This isn’t the way to do it. Part of the reason for providing free wi-fi is to allow users to do what they would do anyway, i.e. check prices and read reviews online. Therefore, providing barcodes or QR codes to scan next to products, or prompts to download apps may help to ensure that they check reviews and look for product information on your app or site, not Amazon’s. This may be in the form of codes to scan to unlock specials like free coffee or discounts, or to send prompts to user’s phones highlighting new products and promotions. Startups looking to become the next big thing on the social web may find it more difficult to raise capital going forward, but there’s good news for the major players in the space today: the amount of money advertisers spend on social ads is set to grow considerably in the next several years. By just how much? According to a new report by BIA/Kelsey, spending on social ads will double in four years, growing from $4.6bn this year to $9.2bn in 2016. What do Pinterest business pages mean for brands? Last week Pinterest announced the latest step in its move towards monetisation with the launch of new business pages. The new pages offer verification – similar to Twitter’s verified accounts – as well as easier access to new buttons and widgets. Pinterest has also created a dedicated site for businesses, which contains best practices, case studies and documentation. Businesses have been using the social network for some time now, and we’ve previously highlighted six brands making good use of Pinterest as well as looking at stats that suggest it drives more sales than Facebook. However this is the first time that Pinterest has officially welcomed brands to its platform. According to Econsultancy’s recently published Content Marketing Survey, the number of search queries for the phrase ‘content marketing’ has more than doubled in the past two years, a reflection of the fact that more and more companies are turning to content marketing to promote their wares. When used effectively, content can be one of the most powerful marketing tools, but many companies dipping their toes in the content marketing water are making huge mistakes in how they develop and execute their strategies.